In January 2017 a group of artists from UK and India came together for an intensive two-week residency in Bapugaon a remote village in rural Maharastra, India. Warli painters, artists and craft workers, a musician, filmmaker, story- teller, designers and ceramic artists, collaborated in creating an installation, Heart:Beat, in the landscape of the village, as a collective response to the idea of establishing an art centre, Kendra, as a site for the preservation and development of Warli cultural creative practice. The residency culminated with a one-day “pop up” exhibition event in the heart of the village. 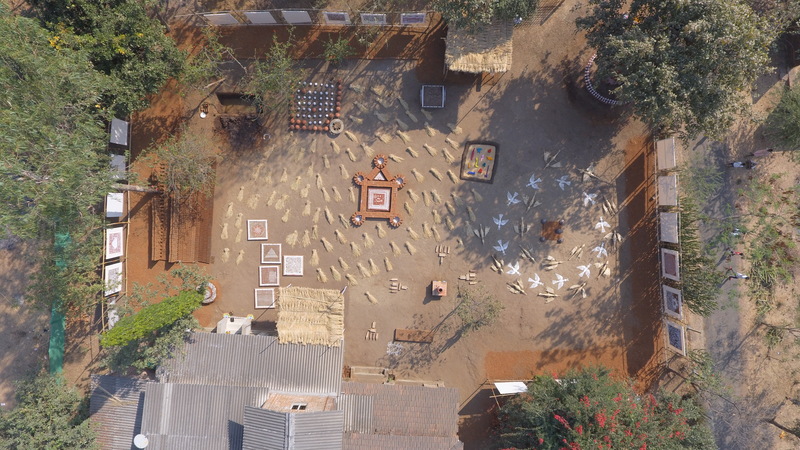 Several commissioned Warli paintings were hung around the perimeter of the site where the project artists’ installation works were set out. Over 1000 visitors passed through the exhibition on that day. Developing the idea of cross-cultural exchange the artists made a link between the changing Bapugaon village and regeneration ambitions of a UK city, Stoke-on-Trent, and a further exhibition of the Heart:Beat installation was presented in Stoke as part of the British Ceramics Biennial in September 2017. At Touchstones Rochdale the Heart:Beat installation is re-configured with new commissioned works introduced. Extending the reflections on the potential consequence of change and highlighting the role of women within Warli traditional and future cultural practice. The exhibition includes over 25 Warli paintings alongside film-works, sculptural pieces, clay and ceramic materials, objects, poetry and sound works. Photographs and information provide a rich account of the project. The Heart:Beat project has been funded by Arts Council England as part of the Re-imagine India programme within the 2017 70th anniversary of Indian independence.